When it comes to old time suckers charms sweet and sour pops are one of the most popular. You get 10 flat pops with a sweet and sour flavor all in one. These are perfect if you are looking for 50's party favors, candy for goody bags or just to eat. You can also buy charms pops in 48 count boxes. 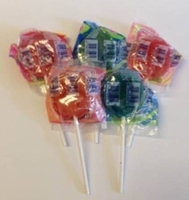 Choose from sweet and sour suckers , sweet pops or cotton candy pops give them all a try , you won't go wrong.